Sometimes when you don't know what else to say, a simple 'thank you' will work. In character, in manner, in style, in all the things, the supreme excellence is simplicity. Be simple. Be Real. Everyone has a right to live in his own way. But in the process, should not compromise moral and social value. A person with moral value acts on decisions, and actions. Those that are good or right and those that do not intend to hurt others. Social value means one always behaves in the most appropriate manner. Words spoken with good manners have reached a lot more hearts than words spoken sternly. If you're a gentleman you would hold the door open for anyone not just lady's it's called manners. Maturity doesn't mean age. It means sensitivity, manners, and how you react. There is no rest for the person who has envy, and there is no love for the person who has bad manners. Manners are standards of conduct and behavior which are not forced upon anyone but yet help in distinguishing the polite from the impolite and the refined from the unrefined. 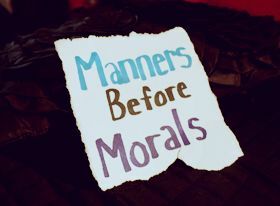 Manners are laws that set standards for a human behaviour. What sets them apart from laws is the fact that there is no formal punishment if you break these laws. You may only suffer from indirect punishment that is disapproval by public and society. Manners make a man. You should be refined, polite and civilized in your manners because they are the hallmark of an educated human being.